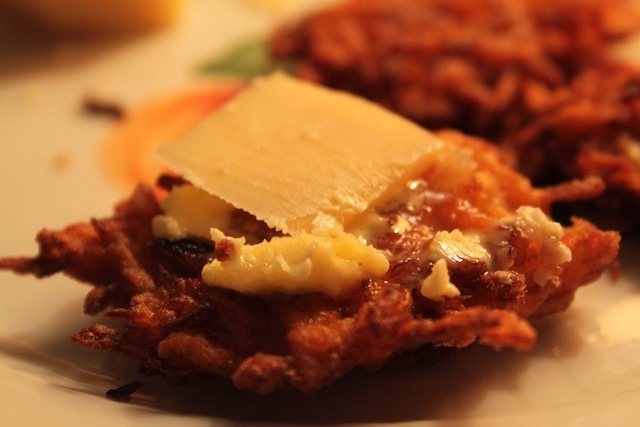 Welcome Back Berlin Fritters: Sweet Potato & Fennel Fritters – Eat Me. Drink Me. I rode my little Hercules down Bergmannstr., and as I did, it started to rain, skinny drops that snuck under my scarf. But even with the rain, all I felt was joy to be reunited with my bike, my little Hercules. I forgot that I need to find another job, need to meet more people, am still so new somewhere. I pedaled through the rain, a route that is familiar to me now and realized, I have stopped comparing Berlin to Brooklyn. Because coming back, even after having been in New York, in my own beloved Brooklyn, feels like coming home. Coarsely grate sweet potato, carrots, and fennel bulb. Add onion and garlic. Season with nutmeg, Jamaican jerk seasoning (optional), salt, and pepper. Add eggs (3 if mixture is still too dry) and enough flour so that you can form patties with your hands that don’t fall apart. At least ¼ cup – but I didn’t really measure, so I don’t really know. Sorry. Generously cover the bottom of a skillet with vegetable oil and heat over high until hot (water sprinkled on the oil will sizzle). 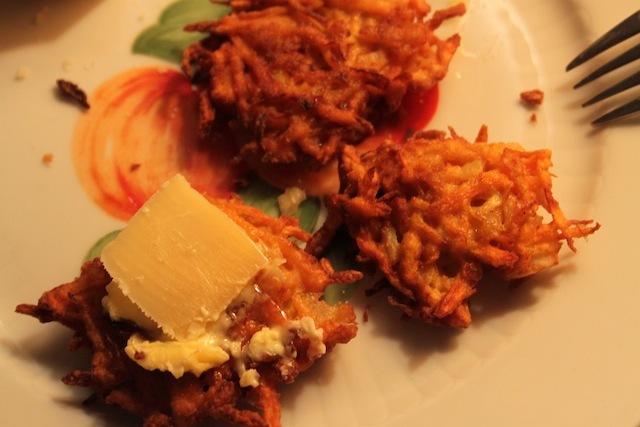 Slide fritters into hot oil and fry on each side until light brown, about 2 minutes per side. Dry on paper towels. Top with butter and aged gouda. Or you could top with crème fraiche and parsley, which is what I really wanted to do, but couldn’t, since I didn’t have the foresight to pick up those things from the grocery store, nor did I want to walk down and then up 5 flights of stairs for a trifle.